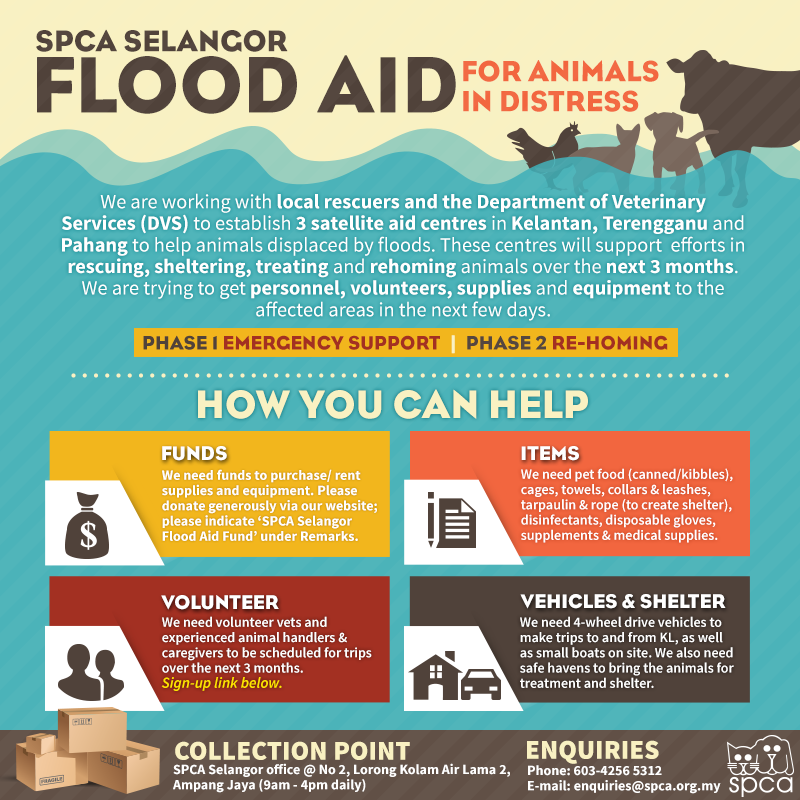 We are working with local rescuers and the Department of Veterinary Services (DVS) to establish 3 satellite aid centres in Kelantan, Terengganu and Pahang to help animals displaced by floods. These centres will support efforts in rescuing, sheltering, treating and rehoming animals over the next 3 months. We are trying to get personnel, volunteers, supplies and equipment to the affected areas in the next few days. Our next aid run will be on 2nd January to send over food and other supplies! We need funds to purchase/ rent supplies and equipment. Please donate generously via our website; please indicate ‘SPCA Selangor Flood Aid Fund’ under Remarks. We need pet food (canned/kibbles), cages, towels, collars & leashes, tarpaulin & rope (to create shelter), disinfectants, disposable gloves, supplements & medical supplies. We need volunteer vets and experienced animal handlers & caregivers to be scheduled for trips over the next 3 months. We need 4-wheel drive vehicles to make trips to and from KL, as well as small boats on site. We also need safe havens to bring the animals for treatment and shelter. Please SHARE this appeal for help, we're going to need a lot of help to carry out this aid campaign for 3 months! A special thanks to Petfinder.my for their awesome initiative in setting up the Flood Relief Communications Centre and volunteer sign-up system!